This ones a little bit different, your probably not going to want to read if your not a dog lover, although maybe if you have pets in general you may like this one. 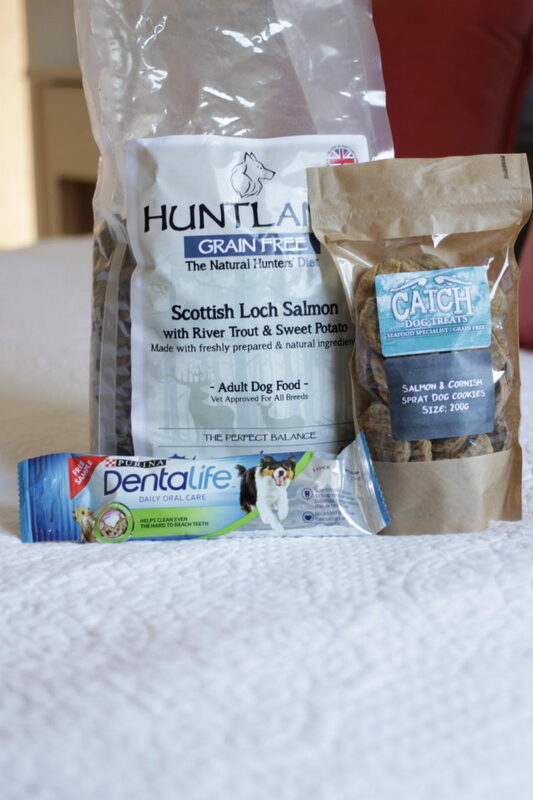 PetShop got in touch to see if my pups(Arthur) would like to try some goodies from them. Of course I said yes, I get super excited when buying things for Arthur, so getting something in the post made a tad too excited. He knows the word present, so you can imagine his excitement when I said, Arthur theres a present for you. He was jumping up at me, trying to bite the box. He is quite the excitable 5 year old. The pet shop is a online pet supplies store, which holds loads of animal related stuff. I couldn’t think of any other word for ‘stuff’ it doesn’t sound the best but where gunna roll with it. The first thing that was in the box was some Huntland Salmon Grain Free* dry dog food, Arthur only eats dry food, by which I mean he turns his nose up to wet food. He is a little picky too and only likes one type of dog food, so I was a little un-certain when it came to this. He surprised us all and absolutely loves this stuff. We are already thinking about ordering some more. There was also two dents sticks from Dentastix* which we already know Arthur loves. I just wish he would take his time a little more with them. If I am wanting some quiet time from him, I give him one thinking this will keep him quiet for a little while but no. Down in one and even more excitable. The last item in the box is some Catch natural salmon and cornish sprat cookies* which are a natural dog treat, no idea what this is but Im gunna be honest with you. This stuff stinks. Like seriously stinks. But again Arthur seems to love them. The box has been an absolute hit with Arthur. He loved every minute of it. From the moment the delivery lady knocked on the door, to putting the parcel down on the floor this dog was crazy about it. If you have animals at home who love presents as much as Arthur does make sure to check Pet Shop out! This post contains gifted items, however all opinions are on my own.